At the beginning of the twenties and thirties, you would usually see a group of intellectual gentlemen, mostly poets and writers, sitting in the cafes of Erbil in stylish clothes with their red hats. Those gentlemen were called Effendis. The Effendi generally means the intellectual, stylish person who is respected by everyone in his community. Just a year ago, Goran Pshtiwan, Omar Nihad and Ahmad El-Sheikh decided to bring back the effendi phenomenon in a modern and trendy way. 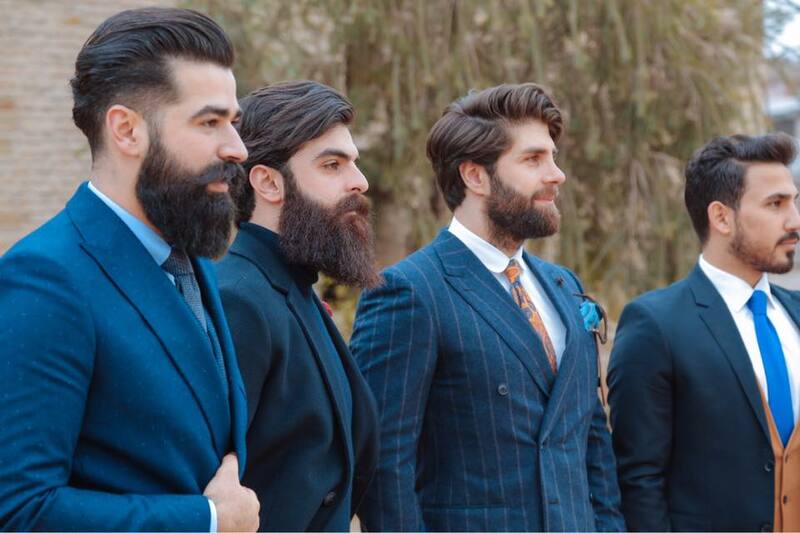 They founded a club called Mr. Erbil, where they wanted to gather young men who are interested in fashion to change some of the traditions in the society, such as women’s rights and environment. Even though the members of Mr. Erbil do not have any background in fashion, they decide their ideas and designs together. Today, they have 32 types of jeans and a wide collection of formal and casual outfit’s that are inspired from Kurdish traditional clothes, On many occasions, they use fabric used in traditional clothes for its good quality, to design pieces like men’s ties. Ahmad Sheikh is specialized in this and sees that designing this high-quality fabric for clothes is also environmentally friendly. 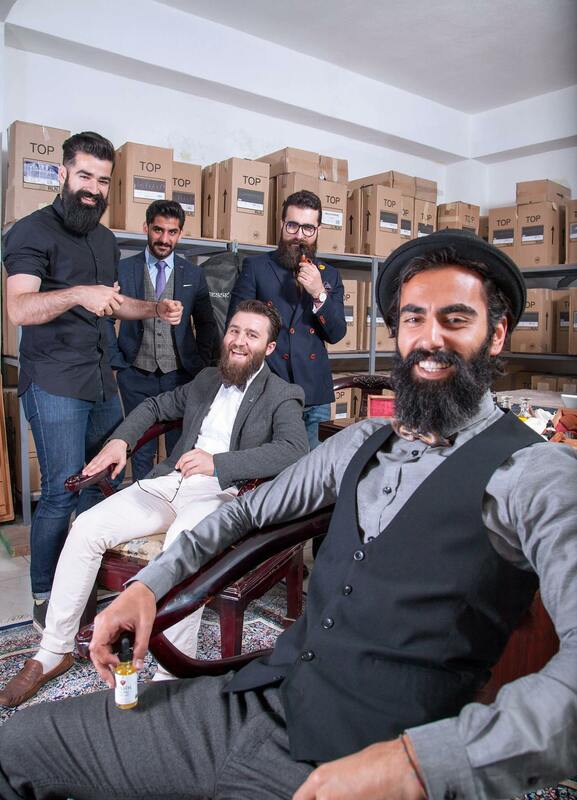 The group has also created the first handcrafted beard care company in Kurdistan called Rishn, where they use a range of high quality oils. Nihad Omar explained that he has been using oils in Rishn for a long time, and when his friends and relatives noticed that his beard looked a lot nicer, they asked if they could try it. Here the group started researching in order to make the company. “We are currently bringing our oils from the US and soon, we will make a new type of oil mixed with oud oil smell” He told ZÎV. How did you gather yourselves? Mr. Erbil established a year ago. The time that we created this gentlemen’s club was not in a very good situation. Back in 2014 the region started facing a major economic crisis and an unexpected war against ISIS. In fact, our region was facing all these issues, but we as a young energetic generation of this region, were still optimistic about the future of the region and we decided to forget all the crisis we had and step forward. The main reason was to bring hope and bring back the taste of classic fashion style which we had back in 1920s known as “Effendis” style. What did make you decide to do this fashion club? Who did inspire you? We were influenced by PITTI UOMO which is an organization that took place in Florence, Italy, but ours called GGE16 (Gent Gathering Erbil 2016). So, we as a Mr. Erbil have a gentlemen’s club here in the region. We get together and talk about the latest news about fashion, clothes design and new trends. Now, we have our made in Kurdistan products, most of the suits tailoring us, looking forward to attend PITTI UOMO event and represent our region and nationality as a Kurd. We are influenced by the classic style and we modernize it with the new fashion taste. We also show the people our national (cultural) Kurdish clothes (outfit) with different styles based on the different cities. was the Iraqi and Kurdish’s first response to your club? What is your next step? What are your broader plans? We do have a lot of projects and tons of ideas ready and waiting, one of the most important for us rights now, is that we will be releasing a new line for blazers and classic style trousers, with handcrafted and customized shoes, which we recently held in our last 5th event Gents Gathering Erbil 2017 (GGE17). We are also working on another upcoming project which is to have our own physical place where we will have a presentation of our products, a classic café, a tailor, and a barber all together. We will have a dress code for our gents where they can have a haircut,order a custom made suit and enjoy their time. Do you think there will be Ms. Erbil soon? We would love to see Ms. Erbil in the near future to initiate such a project in Kurdistan. We believe that it is the ladies responsibility to start a project like this. Once they have done that, they will have all the support from Mr. Erbil. What are the challenges for Ms. Erbil to be as free as Mr. Erbil? The challenges would be the social and cultural pressure. When we first started Mr Erbil, though we received a lot of positive feedback we also faced a fair share of negative criticism. We believe they too will face the same challenges, if not on a larger scale to that of Mr Erbil. Posted in ART, CULTURE, FASHION & BEAUTY, FEATURE and tagged #Fashion, #KurdishMen, #Kurdistan, #MenClub, #MenFashion, #Mr.Erbil, #MrErbil, ART, Kurdishpeople. Bookmark the permalink.